The bond election is set for Saturday, May 4 with early voting to begin in April. WICHITA FALLS, TX (TNN) - City View ISD is getting ready to host its first town hall meeting on Thursday to discuss the proposed $10 million bond election this May. After a committee studied both City View ISD schools for three months, the school board decided to call for a bond election to make many repairs to the school district. The $10 million bond would allow for renovations of every bathroom in the elementary school and replace 40-year-old air conditioning and heating units. 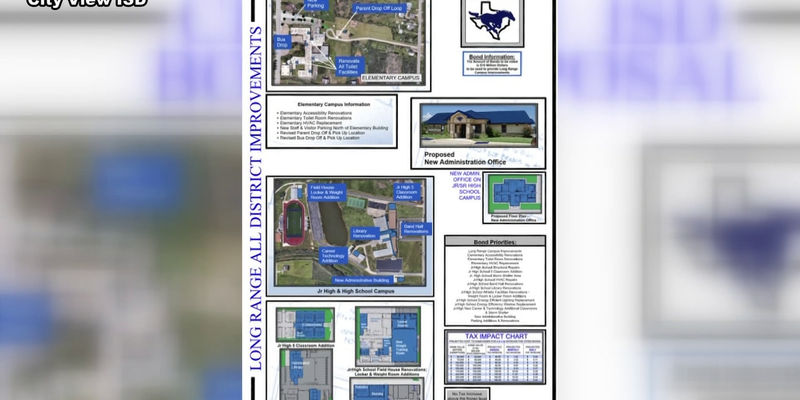 Other items on the list include; expanding the field house for locker rooms, expanding the agriculture shop to allow career and technology courses to move into the building, and constructing a new administration building behind the Junior-Senior High School. “People are asking a lot of questions, so we hope to just give them answers, factual answers about what this bond money is going to be used for,” said City View ISD Superintendent, Tony Bushong. On Thursday, March 21 a town hall meeting will be held at City View Baptist at 6 p.m. to provide more information on the bond and explain how exactly this bond would affect taxpayers. A second town hall meeting will be held at the same location and time on April 8 for those who cannot make it to the first one. City View ISD also plans to have an open house for the Elementary School on March 28 from 5 p.m. to 7:30 p.m. and April 11 for the Junior-Senior High School. Bushong said this event is for parents and community members to see the great things that are taking place at the school district and to get a closer look at the repairs the committee included on the bond.